As I wrote earlier, our town’s formal Memorial Day observance was held today, the traditional Memorial Day. Because it was a weekday after a long weekend, I expected that there would be few people at this celebration. Having missed last year’s celebration for the daughter’s wedding, I wasn’t quite sure what to expect. Our new hometown did not disappoint. 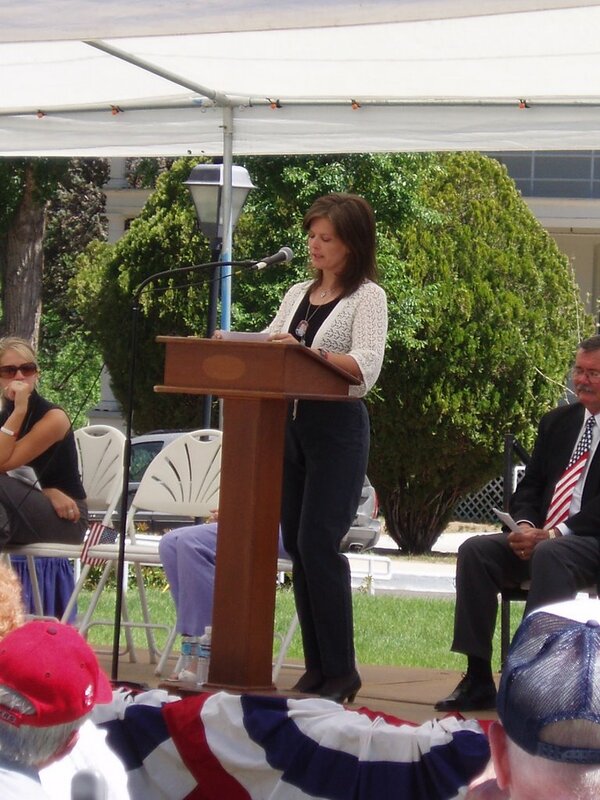 The observance was held in the courtyard at the flagpole on the grounds of the Bob Stump VA Medical Center. This morning was another of those wonderful, beautiful sunny days in northern Arizona: a light breeze, balmy temperatures and a cloudless crystal blue sky. The Bob Stump VA Medical Center is set on 137 rolling acres of land and is a collective of buildings that house the medical and rehabilitation services for those who have served our country in times of war and peace. On any normal day, it is a beehive of activity of veterans and their families and those who serve them; today, it was a teeming city of veterans and their families and neighbors come to honor their fallen brethren. 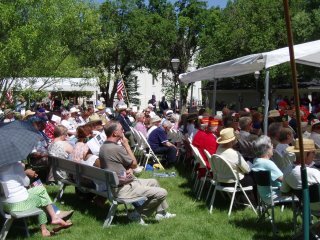 There were many veterans of the Second World War and Korea in attendance many now well into their 80’s, but I noticed the large number of Vietnam Veterans standing proud and even a smattering of OEF and OIF veterans paying respects on this fine day as well. The 2006 Memorial Day service honored 22-year-old Sgt. 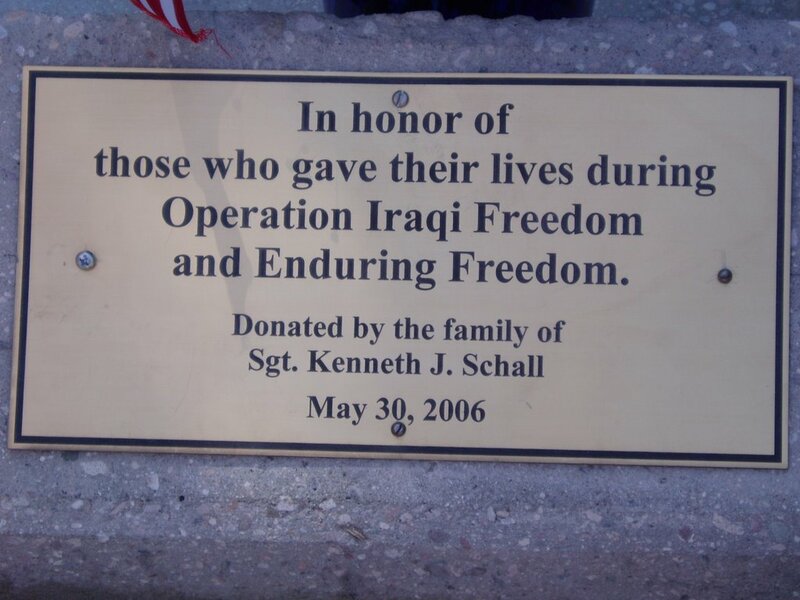 Kenneth Schall who was killed in Iraq in May 2005 and buried on Memorial Day last year. 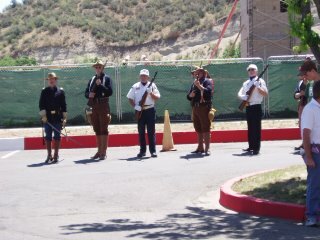 The program began with the presentation of Colors by the American Legion Post, a performance by a lone bagpiper, and a parade on the grounds by the Arizona Roughriders, Northern Arizona All Airborne and the (ROTC) Young Marines Color Guard. Not cowed by the ACLU, there was a passionate invocation by the VA Chaplain for those that fought and were lost and for those that returned, and for those still defending our freedoms against insidious evil. Given the loud, “Amen” at the close, there was no doubt in my mind what answer would have been given by those present had anyone dared ask, “Why are we fighting in Iraq?” The few hundred assembled loudly proclaimed their Pledge of Allegiance to the flag as one nation under God. We were treated to a moving and fervent rendition of our National Anthem (in English) by the late Sgt. Schall’s younger sister, Jessica. 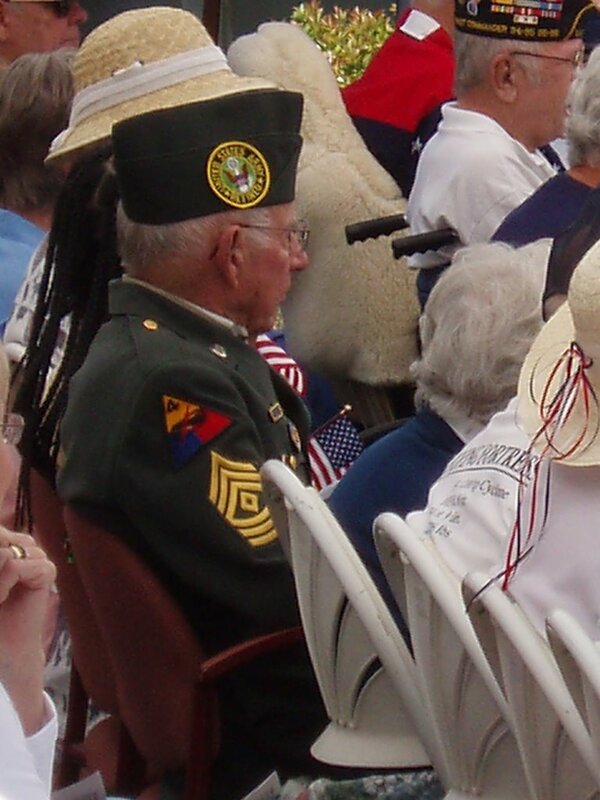 After a too-long performance of patriotic songs by a local group of singers, Sgt. Schall’s mother Terri addressed the crowd. Terri Schall told us the story of her delightful and brave son who had a passion for the work he did in the Army. She told the story of his tenacity -- how he had crawled out on the 2nd story window ledge at his barracks to harass and convince a buddy to accompany him for a late night pizza after he had been turned down by the buddy five or six times. This Gold Star Mother, her voice occasionally breaking, told us how close he was to his new brothers, his commitment to the mission, how “his troops” gladly followed him because they trusted him and his leadership. She told us all how much she loved her son, how hard this past year had been, how proud she was of him and the sacrifice he had made. There wasn’t a dry eye visible as she told how the family had traveled to Ft. Riley to attend the welcome home ceremony and celebration for 2/70AR and how she cherished the hugs and stories from her son’s buddies. Terri said people often asked her if she thought we should be in Iraq. (I’m wondering how you ask a mother in not so many words -- so do you think your son died for “nothing”?). She told us that Kenny believed in the mission, in the good he was doing, in the hope he brought to the Iraqi people… how he had told her that he felt he had helped bring freedom to these people. She said that if anyone wanted proof of the commitment to the mission in Iraq, you only needed to look at her son: he had left his family, friends and home -- everything he loved and cherished -- to go to Iraq and Kenny’s commitment could never be wrong. She was honored to be his mother. Of course, from the moment she began speaking, tears filled my eyes and quickly spilled down my cheeks. It was hard to control the sobs when she told us that the last time she had spoken to her son was on Mother’s Day 2005 and how he had told her he loved her and she had told him that she loved him, too, and that she was so proud of him. The Vietnam vet next to me that I met just minutes before borrowed a tissue, and we stood arm in arm as Mrs. Schall spoke. I watched Kenny’s father, sister Jessica and brother Matthew, aunts, uncles and cousins weep as Terri thanked them and the military community for their support this past year. Next, Sgt. Kenneth Schall’s mother and sister placed a wreath in front of the new memorial to the veterans of Operations Iraqi Freedom and Enduring Freedom -- the large brass memorial that the Schall family donated and now permanently placed beneath the towering flagpole at the medical center. Between the boots, at the base of the inverted rifle holding the helmet, they had lovingly placed pictures of their son, brother, nephew and friend. 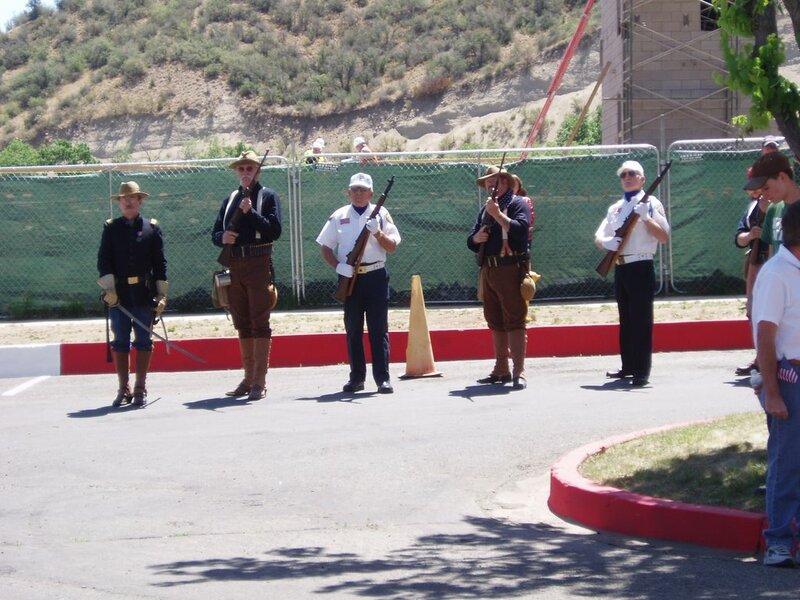 The honor guard -- former Marines and the Arizona Roughriders -- issued a 21-gun salute, and two soldiers now in their 80's rendered an echo version of "Taps" that brought new tears from those assembled. Thank you Sgt. Schall, thank you to his family, too. Just a note: Over the sound system during the dedication of the Memorial played a beautiful song written and sung by Sgt. Schall’s sister, “Soldier I Thank You”. His sister performs professionally under the name Jordan Leigh… you can see a slide presentation supporting the troops and listen to some of this really fine song HERE. Then 19-year old Jordan singing the National Anthem at a Phoenix Suns Game. That is do very awesome -- thanks for sharing this with all of us! WOW! Thank you for this heart-felt article about such an amazing hero. Although I was not present at the service, I feel like I was able to experience it through your words. Thank you for continuing to honor my hero and my friend, Sgt. Kenneth Schall. 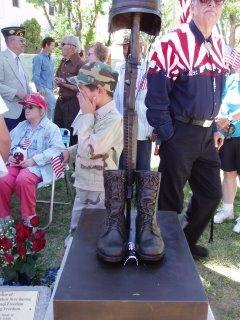 Hello to the Schall Family Of Sgt Kenneth Schall. I want to first give you my condolences on the lost of your Son/Brother/Husband.Etc. May God Bless you all. I am a Schall and it hurts. Something about the name brings us all together.